Ron Sexsmith in Concert A Toronto-based singer-songwriter with an international following, Ron Sexsmith has seen his songs covered by everyone from Rod Stewart to Nick Lowe. Though far from a household name, Sexsmith has won over countless famous musicians, including Paul McCartney, Elton John, and Elvis Costello. 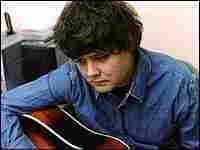 "Least That I Can Do"
A Toronto-based singer-songwriter with an international following, Ron Sexsmith has seen his songs covered by everyone from Mary Black to Rod Stewart to Nick Lowe. Though far from a household name, Sexsmith has won over a laundry list of massively famous musicians, including Paul McCartney, Elton John, Elvis Costello, Steve Earle (who produced his 2001 album Blue Boy), Sheryl Crow, Bono, John Prine, Radiohead, and Coldplay's Chris Martin (who lends vocals to the Sexsmith song "Gold In Them Hills"). Sexsmith performed a concert from WXPN and World Cafe Live in Philadelphia on Jan. 12. Armed with a passion to keep writing better songs, Sexsmith just released a new album titled Time Being. The disc's producer, Mitchell Froom, has worked with Elvis Costello, Crowded House, Suzanne Vega, Paul McCartney and more, while playing a pivotal role in Sexsmith's career, producing three of his early albums.